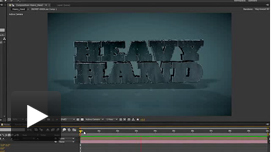 GPU-accelerated ray tracing enables 3D beveled and extruded text and shapes to be created directly inside After Effects CS6 at maximum speeds without the need for an external animation tool. You can now design more physically accurate scenes to create beautiful results such as reflections, transparency, soft shadows, and depth-of-field blur with NVIDIA GPUs. The Global Performance Cache feature makes After Effects faster and more responsive than ever before by taking full advantage of the power of your computer's hardware. NVIDIA GPUs allow you to accelerate previews when drawing images to the screen for a highly interactive experience. New NVIDIA® Maximus™-powered workstations deliver the fastest effects and most fluid Adobe Premiere Pro workflows possible. These innovative workstations allow Premier Pro to harness not only the graphics capability ofQuadro GPUs, but also the tremendous parallel processing power of Tesla™ GPUs. 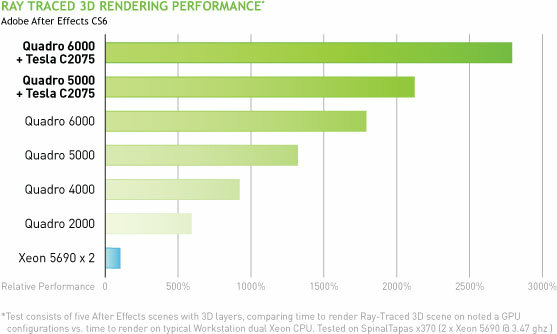 > Learn More about NVIDIA Maximus technology.